How to Plan an Engagement Party. Now that you have a ring your finger, it’s time to plan an engagement party! But who hosts it? Who is invited? And when is the best time to have it? Here are some of the ins and outs of planning an engagement party. Decide who throws it. Historically, the bride’s parents host the engagement party but these days, just about anyone can do the hosting duties. Parents of the couple can co-host and some couples even take care of the hosting duties themselves! There can be separate parties for family and for friends. Be open-minded and gracious to whoever wants to celebrate you! Pick a style with an appropriate menu. The engagement party is decidedly smaller and more low-key than the wedding and rightfully so because you don’t want it to overpower your big day. But if there is a party, there needs to be food and drink. Some couples opt for casual affairs like backyard barbecues, brunches, passed hors d’oeuvres and even oyster roasts. But if you’re all about the glam, you can absolutely plan a more formal event with a sit-down meal. Let the style of your party and your menu go hand-in-hand. Choose a location. 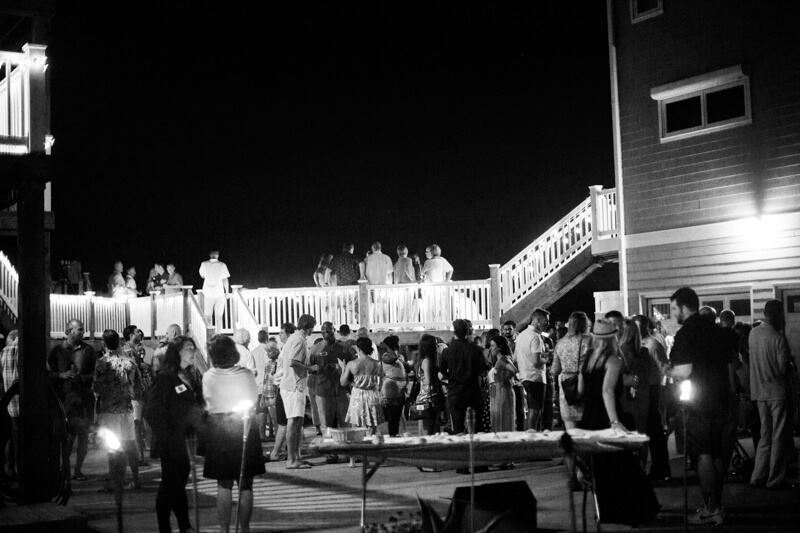 Private properties, family homes and beaches are great engagement party locations. They’re easily accessible, readily available and affordable. But if you live in or near a big city with lots of chic venues and rooftop restaurants, a stunning view is hard to beat! If you’re having a hard time deciding, just think about what speaks most to your style as a couple. Come up with a guest list. No matter who hosts the engagement party, you are responsible for the guest list. And the first rule is: don’t invite someone to the engagement party that won’t be invited to the wedding. Also, keep in mind that it’s okay to keep it small and intimate. You are not obligated to invite everyone you know. Think about the key people in your life – family and close friends – and the folks you know will be excited to celebrate with you. Pick a date. This one is a little tricky because you do have to put some thought into when you have an engagement party. You don’t want it to be so soon after you get engaged because you need to take time to not only revel in the excitement but ensure all of your loved ones have been told. But you also don’t want it to be too close to the wedding so as not to overpower that celebration. If you’re getting married in more than a year, having an engagement party within six months should be ideal. If you’re getting married sooner rather than later and someone wants to throw you an engagement party, it’s best to have it as soon as possible. Send invitations. Work with your host on this and let the type of party you’re having lead the way. If you’re having a more casual party at, say at a nice pub in your hometown with friends, then send an e-vite and keep it low-key. If you’re opting for a more formal affair, try ordering nice paper invitations that show off your style and personality. Bring it to life. The amount of décor and added accents your party needs depends on the style and size. You might not need a lot if you have a lush, outdoor space. Or, if you choose a fancy sit-down evening, you may want to look into some nice floral arrangements for the tables. Candles are universally acceptable, as are string-lights and lanterns. Employ the help of your crafty friends to help bring the party to life and don’t discount the impact activities can have on your evening, such as lawn games, making s’mores, a personalized photo booth, and fun facts about the bride and groom. Planning an engagement party doesn’t carry near the amount of pressure a wedding does, so have fun and get creative. This is the time to truly let your personalities shine, show what makes your relationship so special and to celebrate all the excitement to come!